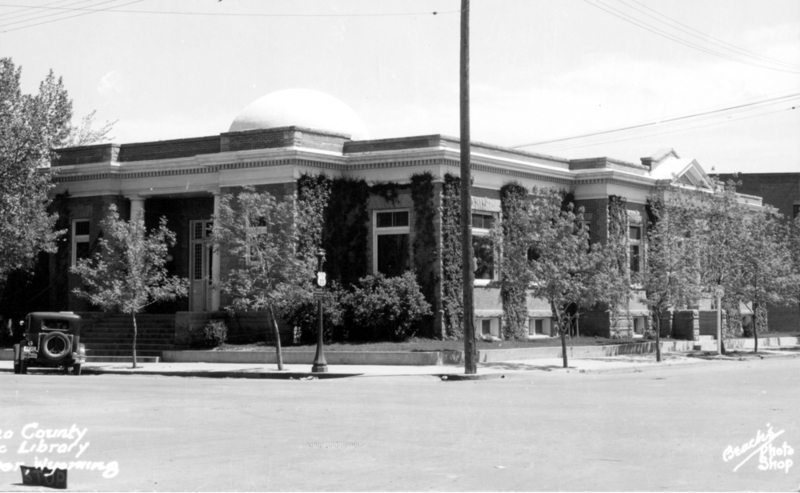 The Cowboy Carnegies campaign seeks to raise awareness of Wyoming’s Carnegie library buildings and promote their preservation and continued use. AHW recognizes the importance of the remaining Carnegie buildings, constructed as centers of community learning and gathering, and serving as the site of many formative experiences for Wyoming’s citizens. The Carnegie buildings are architectural gems as well, created with a sense of dignity and elegance that added to a community’s character when they were built in the early twentieth century. Communities today remain enamored with their Carnegie buildings, but there are still threats to their continued existence, and regrets over those that have been demolished. AHW hopes to help preserve them as vital elements of the state’s architectural and cultural landscape. As a boy of 13, Andrew Carnegie immigrated from Scotland to the United States in 1848 with his parents and younger brother. They settled in Allegheny City, Pennsylvania. Rather than attending school, Carnegie worked to help support the family—first at a textile mill, then as a messenger boy, and eventually with the Pennsylvania Railroad. But, as he reported in his memoirs, he educated himself at a private library owned by a Colonel James Anderson who allowed local boys access to his collection of books on Saturday afternoons. Carnegie’s business interests eventually coalesced around the development of steel needed for the construction of railroad bridges and the burgeoning skyscrapers in American cities. In 1875 he opened a steel mill in Braddock, Pennsylvania, and a little less than 20 years later, in 1892, he formed the Carnegie Steel Company. In 1901, as one of the wealthiest men in the nation, he sold his steel business to J. P. Morgan for almost $500 million (it later became U.S. Steel) and turned his energy toward philanthropy. One commentator called Carnegie the most contradictory of the robber barons: he supported workers’ rights, but destroyed unions, and when he acquired the largest fortune in US history, he tried to give it away. Andrew Carnegie died in 1919. Click on an image and hover to read more. In 1876 the American Library Association was formed. In 1886, Carnegie would begin giving money to build free public libraries. There would be two phases to this program, which have been referred to as the retail and wholesale phases. In the retail phase, which lasted from 1886-1896, he would give money to communities, usually where he had a business interest, to build a public library. Most of these would be located in Pennsylvania. In 1892, Carnegie would form Carnegie Steel. In the wholesale phase, which lasted from 1898-1919, communities applied for a public library building grant. 1901 was a turning point for the library program. That was the year when Carnegie Steel was sold to J.P. Morgan for a mere $480 million. Carnegie also officially retired, the library program really took off. Instead of overseeing this philanthropic endeavor himself, Carnegie instead turned the program over to his private secretary, James Bertram. All of the correspondence would go through him. One side note, is both Carnegie and Bertram were members of the Simplified Spelling club. So all of the correspondence was written as such, which made for some interesting and sometimes confusing reading. The program was revised as needed, especially during the first couple years, as new problems came to their attention, and learning from some of their early mistakes. At the beginning, citizens were asking Carnegie for a public library for their town, and Carnegie would say yes, only to find out later that the town officials either did want the library or did not want Carnegie’s money, or even for legal reasons. So they adapted as time went on. There would be two criteria to receive a Carnegie Public Library Building Grant. First, the community would have to supply a building site. For the most part, the building site would be located on Main Street or very close to it. In some cases, the site may also be near the railroad depot. This was important in some locations, as these communities were growing in population as more people were heading West, and if the town could boast that they had a public library all the better. Usually, the library would also be near the other government buildings. Since many of the main streets also had saloons, the libraries would be close by, but not too close. The second criteria was that the community, using tax monies, fund 10% of the total grant received for maintenance. Remember the Carnegie Public Library Building grant was only for the building and the furniture. It did not include the books, the salary, and the general maintenance of the building. Bertram wanted to only deal with the library board and the city government (mayor/council). Bertram also preferred the correspondence be typed on official letterhead. Check out the map below to see where each library is located and how it is currently used if it still exists. Is your library, museum, historical society, or organization interested in hosting the traveling exhibit or a lecture on Wyoming's Cowboy Carnegies? Please look over our loan information and then return this form to us, and we'll help you plan! The exhibit is currently in high demand, but we are scheduling 2018.